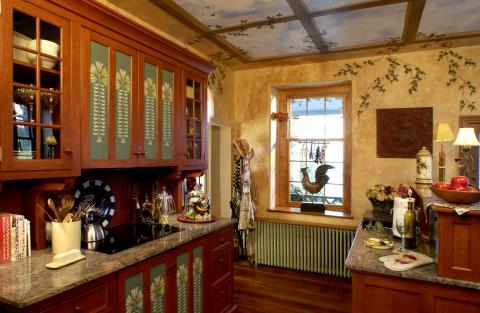 Unleash yourself from continuous kitchen cabinets! Discover freestanding kitchen workstations designed for today’s living! And they are destined to become sought after kitchen heirlooms in the future. The Kitchen As The Soul Of The Home. It is here that you sip coffee on chilly winter mornings. It is here that the aroma of just-baked bread welcomes the family home. And it is here that friends gather to laugh, share and reminisce as part of the culinary experience. Your kitchen, the hub of the home, should offer not only warmth and comfort, but also continuity, in both design and ambiance, with the rest of your home. That is why YesterTec Design Company has created Kitchen Workstation Furniture – hardworking, heirloom-quality pieces of furniture… designed especially for the kitchen. These unique pieces capture the charm of vintage kitchens, offer tons of storage, and create unique workstations that conceal ALL of the appliances! YesterTec has converted a complicated process(cabinetry) into a simple product, furniture! Re-discover the Refrigerator/Pantry from YesterTec. Using furniture, instead of continuous cabinetry, this YesterTec Armoire conceals a refrigerator while creating a unique side-opening one-can-deep pantry. 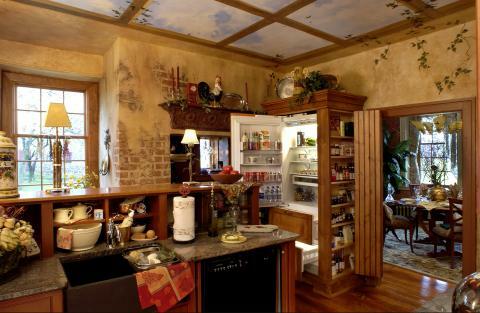 The Refrigerator/Pantry shown is model SZ15-RP-27 made of distressed pine with bead-board sides. It measures 88″ tall, 25″ deep and 40″ wide and as shown conceals a Subzero 700 series refrigerator/freezer. The stand-alone armoire is beautiful and the look is rich, while also being very functional. This unique use of space is great for kitchens where space is at a premium. 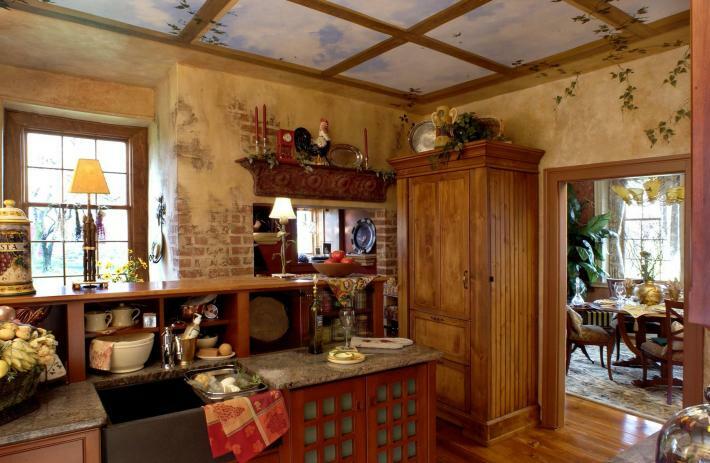 Only a few workstations are required to complete an entire kitchen. The furniture concept also allows the color and texture of the walls, ceiling and floor to be carried through the room… creating a rich custom look! Reinventing the Way We Think About Kitchens. From a treasured antique desk, (here there is one located in the fireplace opening to the left of the refrigerator) to a favorite reading chair, to a utilitarian table, furniture has long been used in the home to express style, while offering function and comfort. 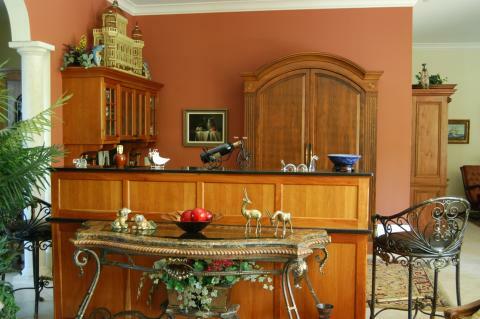 Traditionally excluded from the kitchen area, furniture brings character and personality to a living space. YesterTec’s Kitchen Workstation Furniture reinvents the kitchen, blending your culinary center with your living area, recreating the comforting qualities that define the heart of the home. Fixed cabinetry can be so institutionally stagnant, while freestanding kitchen furniture is so sculptural, making you feel at home and relaxed. Capturing The Old World Styling Of Days Gone By. A YesterTec Kitchen embraces guests and inhabitants with a character of its own. Freestanding armoires in rich natural wood, smooth granite-topped tables and hand-crafted wall cupboards with ornate detail intermingle with heirloom pieces and personal treasures to create an Old World “gathering room” that functions as a state-of-the-art kitchen. Through the elimination of continuous counter tops, the room’s architectural design elements, wall treatments and floor coverings unite the space and allow it to easily flow into adjoining rooms. (The Tuscan styled farmhouse kitchen shown here includes an island that conceals a standard dishwasher behind grid patterned pocket doors. The storage piece on top adds usable counter space and an area to store the coffee maker while protecting the breakfast nook (to the left of the fireplace) from viewing the messy countertop.) As you can see, the real star of this room is the faux painting job that transports us immediately to a farmhouse garden in Tuscany, but it is the independent placement of the workstations that allows the rooms textures to dominate. Many Styles, Finishes, and Materials Available. To create design continuity within your home, YesterTec has designed over 280 models that are available in a variety of styles, shapes, colors, sizes and materials. The arch top armoire below conceals a Subzero 700 refrig/freezer and a full height front opening pantry with 5 pull-out trays and two drawers as well as two side opening one can deep pantries. Innovative workstations include full-height pieces such as ranges that conceal the ‘hot’ appliances (as shown below), refrigerator/pantries, armoires and sink workstations, as well and shorter and shallower pieces such as island worktables, pantries, desks and entertainment centers. Ideal for new or remodeled kitchens, these freestanding workstations offer the ultimate in design freedom. Hand Built Heirlooms Sure To Be Passed Down For Generations To Come. Each YesterTec Kitchen Workstation preserves the look of real furniture while concealing functional work and storage spaces, as well as appliances. In fact, YesterTec patented the technology to safely conceal ovens and cooktops in U.L. Listed enclosures (which is still an industry first) in addition to being able to hide any style of dishwasher and many models of refrigerators! YesterTec furniture is specially crafted to be durable- ensuring lifetime value- by using the toughest finishes and construction practices available. Each piece is hand-built by seasoned craftsmen and its own numbered brass identification plaque guarantees its exclusivity! Destined to become kitchen heirlooms. Next ArticleStealth Technology Applies to Kitchens Too!